This was the affirmation made at the meeting between Mme. 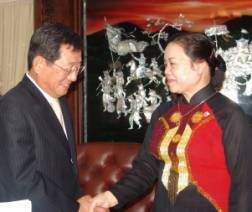 Ha Thi Khiet, President of Vietnam Women's Union (VWU), and Mr. Kim Euki, Ambassador of the Republic of Korea to Vietnam, on May 4, 2006 at the VWU's central office regarding the article "Vietnamese Young Women Coming to Korea – A Land of Hopes" posted by the Chosun Daily Newspaper on April 21, 2006. According to Mr. Ambassador, relations between Vietnam and Korea are seeing fine developments. For recent years, there has been an increase of Korean businesses and Korean citizens working in Vietnam and vice versa. At the same time, there are more and more Korean men wishing to get married to foreigners, including women from Vietnam. In general, Korean mass media praise the harmonious life of the Korean-Vietnamese couples. However, undesirable problems happen in the process. After this incident, RoK Government and concerned organizations will work out specific policies and regulations on marriage broking procedures and processes and take more responsibilities in foreign-related marriages. At the same time, suitable measures will be put on the matchmaking companies of a commercial nature, who harm women’s status and dignity while pursuing their sole profit. The contents of the meeting will be reported to RoK Government and concerned ministries and agencies will mutually work on solutions to prevent similar incidents from happening and affecting the fine relations between the two countries. At the meeting, VWU President Mme. Ha Thi Khiet appreciated Mr. Ambassador’s initiative in proposing the meeting. She said the “21st April incident” was greatly regrettable; however it should not damage the friendship and cooperation between the two countries. It is just a dust that should be removed from the beautiful picture that has been painstakingly created by the two countries. It is the wrong-doing by a single journalist and a commercial advertising agency, which for their own sake hurt Vietnamese women’s dignity. The law of Vietnam always respects the right to marriage including marriage to foreigners. VWU will recommend the Vietnamese Government to cooperate with RoK Government and relevant ministries and agencies to seek solutions. VWU wishes that the images of Vietnamese brides in Korea and Korean bridegrooms in Vietnam are attuned with the fine relations between the two countries. Besides, the VWU will promote communication, education and awareness-raising among Vietnamese women regarding marriage and the progressive and happy family, thus restraining occurred problems. At the end of the meeting, Mr. Ambassador presented VWU with the Vietnamese-language book “Exhibition of Korean calligraphy pieces from President Ho Chi Minh’s Prison Diary”. The exhibition was held on the occasion of President Ho Chi Minh’s 115th birthday anniversary.